Last nite, it got a bit too dark to complete the installation of Scampy's new lock. This morning, we want to install a wood shim between the inside of the door and the lock. At present, the new lock is kinda loose. 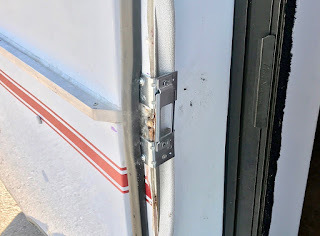 Because the screws that hold the the lock tight against door bottom out before clamping tight. This shim will be fabricated from 1/2" plywood and will match the shape of the of the lock's inside mechanism [We will take a pic to show you]. Also, the two angle brackets that hold the strike plate, are a bit too wide and need to be cut down. We have the tools to do this modification. Even a portable vice! We are in the City of La Mesa where our local mail box is located. When we plan to remain in an area for awhile, we rent a mail box so that we may easily receive stuff that we order online. And of course, receive our forwarded mail. What happened to the new lock? Around the RV campfires of the west, folks spoke about Tioga George as if he must have come to a bad end! What could have happened? It took a whole lot longer than Tioga George figured to intalll. That's what happened. It turned out that the strike plate that was packaged with the new lock, would not work. 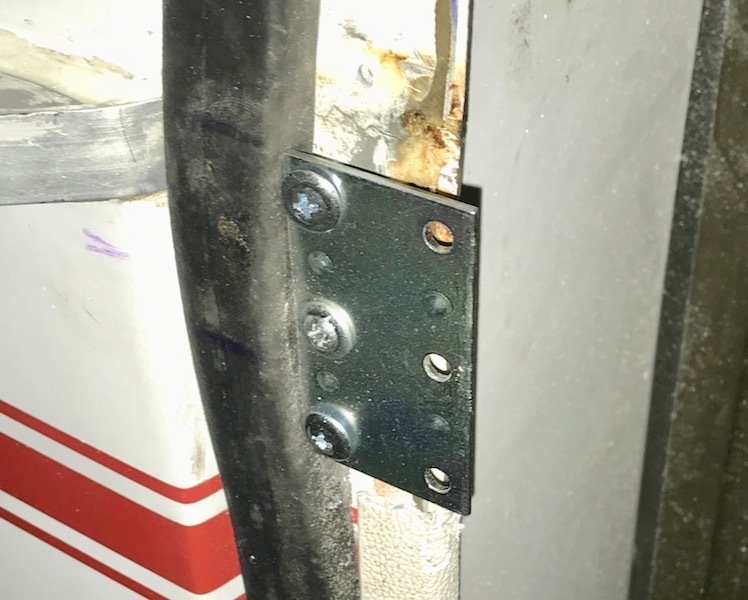 So, we had to engineer a new strike plate! And guess what?! The new strike plate works. Where are the "action packed scenes starting "yours truly"? Aren't you having phun waiting for that action? It's a "Wait and see pudding", Phun. You have to wait and see! If you have a pair of electrical pliers you can just insert the long screws and clip them to the proper length. Or just spend a buck and buy 4 new screws of the correct length. Advantage: cleaner installation. Disadvantage: less tweaking. I believe that I did not explain what was needed properly. The screws do bottom out. But that is not the problem. The inside dimension between the lock's front and back plates, must be shimmed out. Otherwise, the parts of the back plate will not mate properly with the strike plate. I love it when you call me "puddin".